I have a confession. I love using cash instead of cards for our budget... but, I have really struggled with being on top of it. We would have envelopes of cash in our desk, and I’d try and draw money from there when I needed it, but it JUST WAS NOT WORKING! We would have cash with us, but it might be cash from the ‘groceries’, then I had to get something that would be under ‘clothing’. I’d make a mental note, and rearrange the money when I got back home. Not exactly an ideal way of keeping a cash budget. So, as much as I love the idea behind it, I have not been so hot on doing it. It was just too complicated. I needed an envelope system. Something, I did not even KNOW about a few months ago, but thanks to a post on Stacy Makes Cents, I now do. In order to effectively use a cash budget, you need to have a system of organizing the cash in your budget. That is where the envelope system comes in handy. It’s a collection of envelopes to hold different categories of money. There are a lot of different kinds out there. Store-bought ones that started at $20 were kind of ugly. Then a plethora of Etsy ones that were cute, but not what I needed and were even MORE out of our price range. There were also tutorials, but none that really gave me what I needed. Most of them do not have a good way to store the envelopes. I do not want to have to wrestle with a bunch of envelopes while at the grocery store. I am trying to start using an envelope system to make it EASIER on myself to keep to a cash budget, not HARDER. 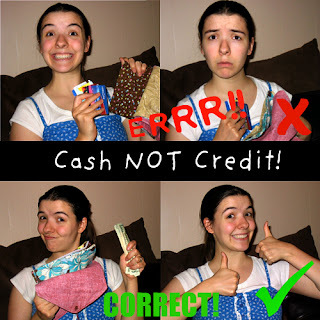 So, I began dreaming up with a cash system that would meet my needs- not cost over $20, easy to use, and if possible look cute. I found it, and today I’m sharing it with you. 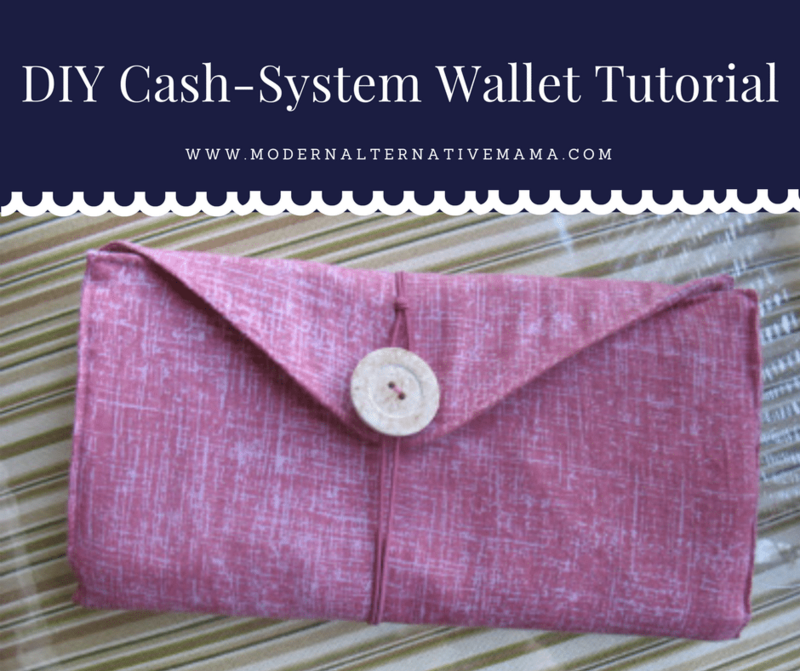 This envelope system is “wallet style” meaning all the envelopes are inside a wallet. I guess I did not need to explain that. I can just open up the wallet and I am greeted with a series of envelopes that are quite accessible. There is also a coin envelope, which excites me probably a lot more then it should! I like being able to make exact change, but I do not want a bunch of coins running around in my other envelopes. It is also custom made, AND REALLY CUTE! But, I’m partial, I made it. Let me begin by saying, there are quite a few steps, but it is really simple to make! I think this could be made in 1-2 hours. It took me a while, but I was making the pattern and taking LOTS AND LOTS of pictures for you. Most of the steps are the little things that just help keep it nice and neat. If you are an amazing seamstress please do not be bothered by the instructions for even super simple things. I hate reading tutorials that assume I know TONS of information. Enough fabric to make two 8.5″ squares for EACH envelope you would like. I did enough for 7, and spent WAY too long picking out those fabrics from my stash. But, aren’t they cute? You will also need fabric for the outside, enough to make two 15″ by 9″ rectangles. A thick, thick fabric, such as upcycled denim from a really old and ugly pair of jeans. You will need enough to make a 15″ by 9″rectangle. You could probably also use heavy duty interfacing, but I made a New Year’s resolution to not buy new stuff for crafts, so I had to use what I (or rather my sister, Thanks Amy!) had on hand. Basically what you are making is 8″ two-sided square. Super simple. 1) Iron all the fabrics you will be using to make the envelopes. This is especially important for a project like this, because everything is straight and clean cut. 2) Cut out a 8 1/2″ piece of paper or paper bag. 3) Use that template to cut out two squares from each fabric you are making into envelopes. 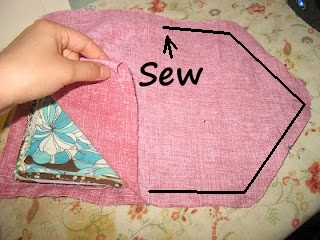 4) Sew right sides together using a 1/4″ seam allowance, and leave a two inch or so part open to be able to turn them out again. 5) Repeat with each (to-be) envelope. 6) Trim the corners of the squares, making sure not to cut the seam. 7) Turn all the envelopes right side out. 8) To make the corners nice and sharp, use a chopstick or pencil to poke them out. 9) Turn the turning-hole in by 1/4″ and iron down. 10) Neatly iron each envelope in half. Get a good crease, you will need it later. 11) If you want a coin pocket, sew the velcro in 1/4″ or so down from the top of the pocket. This is a video on sewing on velcro. First, you will need to make your pattern from paper. I accidentally did not cut my exterior piece long enough (as you can see in the picture below), but I have adjusted the instructions to make it work for you. NOTE: The pattern you will be making from paper WILL NOT include seam allowance, but I will explain that in a bit. 1) To make the triangular part I traced a 2″ (or so) circle in the center of a piece of paper 8 1/2″ wide. The bottom of the circle was on the edge of the paper. 2) I then drew a line from the bottom corners of the paper to the horizontal center. 5) Use the resulting pattern to cut out a piece of denim, or other hefty duty fabric. 6) Fold your exterior fabric so that right sides are facing together and iron. 7) Pin the denim to your exterior fabric and cut at least 1/4″ away from the denim on all sides. You will have two pieces. 8) Unpin the denim fabric and REPIN to just one piece of your exterior fabric. Set the other to the side we will call the piece with the denim A and the other B. 9) Sew the denim onto Piece A. Now it is time to sew the envelopes onto the denim/exterior bit. This is the most fun part! 1) Find the vertical center of the rectangular part (i.e. not the triangular part) of piece A. 2) From the center, measure 1″ closer to the STRAIGHT edge of Piece A, mark in couple places. This is where you will sew the first envelope! 3) Lay whichever square you want in the center on the pretty cotton side of Piece A, still folded, using the marks you just made. Make sure it is straight or you will cry. 4) Gently (as in don’t yank it) unfold the square and pin in place. 5) Sew along that lovely crease you made earlier. 6) You will now sew on all the over pre-envelopes. You will do half on one side of the one you just sewed, and half on the other. 7) Lay the folded edge of your envelopes as near the base of the other envelopes as you can, pin the side that is not next to an envelope and sew along the crease. 8) Repeat with all the squares. The denim side will have a series of seams very close together. 9) Top stitch the sides of your envelopes together. NOTE: I plan on eventually labeling the envelopes, but have not figured out how I want to do it. You can print on fabric though, so I might see if I know someone who has a jet printer I can borrow, then just sew the labels on the outside. 1) With right sides facing together pin Piece A and B together from where the envelopes are attached on Piece A to the tip. 2) Using the edge of the denim as a guide, stitch together just from the envelopes to the tips! 3) Pin the bottom part of Piece A and B together and sew, once again using the denim as a guide. The bottom half of both sides will be open. 5) Fold under the two opened sides, and pin. 6) Top stitch using 1/8″ seam allowance along the entire edge of the wallet. You will have to tilt the envelope system up to stitch where the envelopes are attached. Now, all that needs to be done is the button and elastic. 1) Sew the two ends of a 20″ piece of elastic string to the tip of the wallet. 2) Sew a large button over the ends of the elastic. 3) Knot the loop of the elastic so that you will have a piece that will fit snugly around the button. For the record none of those cards are credit cards. Do you have an envelope system? Have you ever considered making one yourself? Debra is first and foremost a daughter of the King of kings. She and her husband live in Wichita, KS where they raise their two kids, a fantastic toddler boy and precious baby girl. Debra is a full time homemaker whose ministry begins with her family. She spends her days being a helpmeet to her husband, loving on, teaching and nursing her two kiddos, cooking healthy food, keeping home, crafting, and then chronicling the insuing excitement on her blog Sweet Kisses and Dirty Dishes. I’m so glad to see this Debra. My family is starting to use the cash-system method and this looks like a perfect way to keep us more organized! Thank you!! I hope it works for you! I took it shopping for the first time the other day and loved it! Someone commented that there were coupon books you could get for not very much. I’ve never seen them, but they might be something to look into. Ooops! That was meant for someone else. Thank you! I actually have not sewed in a while, then I made this. So, I guess it’s a good project to get the sewing machine out for. I really wish mine had the coin purse. That’s just stinkin’ genius. What a great idea! I’ve never even seen those. Sorry! That comment was for someone else. I am having issues today. Thank you stacy! Your so sweet and encouraging. I LOVE the coin pocket. I think I did a little dance when I thought to do it. How adorable! I will have to put this on my list of things to make this summer once I am working less. Thanks for the great tutorial! Great DIY tutorial. You got a manly version? Ummm… not really. Make it out of a manly or neutral fabric and secure it with a snap or clip? WOW thanks you rocked it i was looking and looking and finally found the perfect cash envelopes. thanks so much for posting it. I will try my best to do you proud. I just finished this and love, love, love it!!!! One tip I have to suggest, you said you cut the bottom too short and made allowance for it…I really think the top “envelope” closure could be longer. Maybe two inches or more so the rounded tip comes down halfway. Thanks for sharing…I can’t wait until payday to stop using paper to seperate and confuse me with our money!!! Just made mine last night. Took me several hours but now that I know what I’m doing, it won’t take as long. I showed the ladies in my Sunday School class and one already asked me to make one for her daughter in law…lol. Turned out super cute and the change pocket is GENIUS!!! This might be a silly question but you say to use the “heavy duty material”. I assume this isn’t seen once put together? Was trying to look at pictures but couldn’t tell myself.